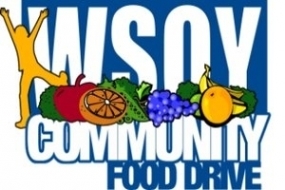 WSOY and our community partners are pleased to announce the 17th annual WSOY Community Food Drive on October 5th at Airport Plaza Kroger on Rt. 36 in Decatur. We have joined together to help stock our local food pantries. Last year, over 1.52 million pounds of food was collected during our twelve hours of broadcast and this year we hope to exceed that amount! To enable the WSOY Community Food Drive to help as many food banks as possible, we encourage the community to give canned non-perishable goods or monetary donations. By giving non-perishable canned goods, we are able to utilize safe offsite storage to allow the supply to last as long as possible. Monetary donations, however, go the farthest. Food banks are then able to purchase goods on an as needed basis and at a tremendous discount through the Central Illinois Foodbank. Every dime raised goes to the purchase of food. Over the past fifteen years, over 9.4 million pounds of food has been collected. Last year, because of the wonderful generosity of the community, the WSOY Community Food Drive was able to assist Catholic Charities Food Pantry, The Salvation Army Food Pantry, Good Samaritan Inn, Northeast Community Fund, The Judy Mason Thanksgiving Basket Project, Reasonable Services, God’s Shelter of Love, AMELCA Food Pantry, the Mount Zion United Methodist Food Pantry, Interchurch Council of Blue Mound, Boody and Stonington, Crossing Healthcare Prescription Produce Garden, Big Blue Backpack program, Annunciation Greek Orthodox Church Food Pantry, Moundford Food Pantry, Helping Hands Food Pantry and Boys and Girls Club Cops and Gobblers Program. Every year the food drive has hundreds of great volunteers, but one volunteer is recognized as being outstanding. The Geoffrey Neuhoff Spirit Award is given to honor and recognize someone that shows exemplary service to the WSOY Community Food Drive. You can make a donation now ONLINE through the United Way: COMING SOON! Kroger is also selling pre-packages bags for purchase and donation prior to the WSOY Community Food Drive. Just purchase a bag and leave it at Kroger in the donation bin! Donate On October 5th By phone: 875-3350 (First Christian Church) – Check pledge, Visa and MasterCard Welcome. Please let them know if your company offers matching. Donate on October 5th at Kroger on Rt. 36, Airport Plaza, Mt. Zion. Thanks to our community partners we are able to again offer a substantial financial award to the top five local schools that collect the most food for our drive. Individuals and groups can collect food ahead of time or come out to Kroger that day and donate canned food or cash in the name of a particular school. The top five schools that generate the most food in pounds will be awarded a cash prize. Anyone can help support their favorite school by donating in the name of your school. Parents, grandparents, booster clubs, bands, athletic teams and teachers can and will make the difference. All Macon County Schools grades K-12 are eligible to participate. We are asking you to join our community partners: ADM, Team Soy – Soy Capital Bank & J.L. Hubbard Insurance and Bonds, Skeff Distributing, Jones & Thomas/JTnet, Decatur Back & Neck Center, Tickets N Trips, First Christian Church, Dale’s Southlake Pharmacy & Colee’s Corner Drugs, DynaGraphics/Wood Printing, Kroger, Herald & Review, and WAND-TV in getting the word out to your employees and the community at large. Distribute bags to your employees to be filled and dropped off at Kroger on Rt. 36 East during the food drive on October 5th. You can also arrange for donation pick up. Employees can also designate their donations to the school of their choice to help those schools win cash prizes for the most food raised. You can also assist us by donating an hourly incentive such as sporting event tickets and gift cards to use as giveaways to encourage giving during our live broadcast. Every year the food drive has hundreds of great volunteers but one volunteer is recognized as being outstanding. The Geoffrey Neuhoff Spirit Award is given to honor and recognize someone that shows exemplary service to the WSOY Community Food Drive. For overall questions and media inquires, please contact Lindsay Romano at 217-423-974. Thank you for your interest in The WSOY Community Food Drive! We would like to learn more about your organization and how we may be able to work together to fight hunger. All applicants must currently be providing food assistance. Please read the guidelines below and download the grant application HERE. Completed applications can be emailed to LindsayRomano@neuhoffmedia.com or you can drop off or mail the application to WSOY Community Food Drive, 250 N. Water St., Suite 100, Decatur IL, 62523. For questions, please call 217-423-9744 and ask for Lindsay. The application process is outlined below. Application is reviewed and assessed by The WSOY Food Drive Committee (herein known as Committee) based on information provided. Fund availability from the 2017 WSOY Community Food Drive is not guaranteed. Fund availability is also determined by donations received during the 2017 WSOY Community Food Drive. (Currently scheduled for October 6th. Subject to change) Funds must first be fully processed before distribution can begin. Should a WSOY Community Food Drive grant be awarded, the funds must solely be used for the purchase of food. Funds cannot be used for administrative costs, transportation, delivery, food storage or processing or other programs/services offered by your agency. Prior to grant approval, the Committee may require a scheduled visit to your organization. The site visit is to confirm the program information you’ve provided and to review compliance of the requirements of the WSOY Community Food Drive grant. Fund recipients agree to sign agreement of WSOY Community Food Drive requirements that all funds be used for the purchase of food.